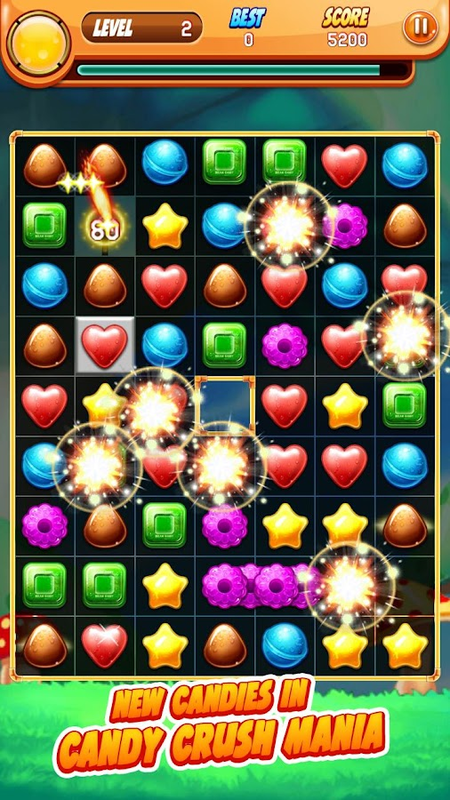 Candy Mania is a brand new casual game with addictive match-2puzzle game!Find the shinning stars and get it! Solve all thepuzzles and try to get three stars in each level! Have fun in thissweetest adventure!Candy Star features:- Sweet and deliciouscandies!- Easy to start but hard to fully master- Two fun modescandy- Fun and easy to play, but challenge to fully master- Manyunique levels to make game more addictiveHow to play:1. Match threeor more identical candies2. Clear blocks, the shinning star willappear3. Make the goal star down to last line to solve thepuzzleFree to enjoy this Candy Crush, it's sweet and delicious! LoL Wallpapers is a free app with more than 120 champs and 700+high quality images that are updated continuously. You can alsoshare these images with your friends.Internet connection toexperience all championswallpaper!----------------------------------------------NOTE: I donot own any of the images/wallpapers that are in this app. Imagesand wallpapers are not belong to us. All rights served © 2014 toLoL and their respectiveowner.----------------------------------------------If you have anyquestions, feedbacks or anything about our app, please send us ane-mail. I will deal your problems as soon as possible. Thanks alot! Shoot bubble worlds/Bubble Shooter puzzle adventure is one of themost popular fun journey game pop/burst/fall down bubble objectgame! Another option to play game when you bored. #one of thenumber 1 legend Puzzle deluxe mania game on the world.To play thisgame is really simple just make combinations of 3 or more bubbleswith same color to make them fall down/crush/burst and Clear allthe bubbles to win game. This game have deluxe beautifull colorbubbles ready to play for you bubbles shooter mania.Shoot/shooterbubble worlds is journey games. Play for free as you shoot/shooterpoke deluxe beautiful bubbles with journey adventure more than 1000leves and Shoot every bubble like a witch trow a spell with theirstick magic witch and make burst/fall down/crush every deluxecolorful bubble as many you can bubbles mania. every deluxe pokecolor like blue bubble, orange bubbles, green bubble, purple bubbleand other mix color poke deluxe bubble ready to burst and crush asyou can. it good news for you Bubble Shooter mania journeylovers.>>>>> How To Play:- Shoot/poke bubble withtap your screen.. and directed at least 3 bubble to make themburst/crush.- Mark your target with same color bubble.-Bouncing/bounce bubble with Tap the Pole at right or left side yourPhone or tablet.- Clear all bubble to finish level and play anotherfun bubble puzzle in this game.- Clear all bubble as fast you canbecause you have limited time to burst/crushbubble.>>>>> Features:- Colorful bubble with cooldesign GUI.- Have 8 color bubble like blue,orangelitght,orange,purple,green,mix color blue,mix color purple and manymore.- Have more than 1000 level ready to play and will add moresoon.>>>>> Tips to Play :- Bouncing/bounce bubble inthis game to make clear or finish level more faster- Shoot/pokebubble with same color at least 3 bubble.- Shoot bubble as fast youcan like a witch will wars spell to other witch with their stickmagic witch.Shoot bubble world wars is a wildly addictive bubblelines crush legend puzzle game!Tap on your screen to poke/shootadjacent bubble to make them crush/destroy, and try to scoring asmany points as possible!You will love the fun bubble shoot maniaworlds and burst or crush bubble lines in this puzzle game withyour hand, your creativity and excitement to shoot/poke bubble willhelp you to finish all lines bubble puzzle more faster andeasier.The power of magic witch wars shoot bubble is in your hands!Shoot bubble and match 3 deluxe bubble to walk through limitedlevels in this completely journey shoot legend bubble puzzle maniaadventure and more than enough to dissaapers your bored time.Solet's get started play Shoot bubble world wars mania and start youjourney adventure in bubble world now!REMEMBER AGAIN !! Burst orcrush bubble a group with at least 3 the same kind of deluxecolorful bubble and shoot or poke bubble like a witch trow a spellwith their stick magic witch and you will get bubble willcrush/burst like bomb!Destroy/crush all target bubble to level up.Clear all level as fast you can.The #1 Classic Bubble Shooter gamein the Play Store!So get ready, aim, shoot bubbles!! Block Puzzle 2017 is a classic yet innovative puzzle game. BlockPuzzle Plus have prepared a new fascinating world to block puzzlegame reminiscent of the classic brain relax block mania game. Youjust need to drag the figures on the playing field, and to fill inthe line horizontally or vertically. Simply drag the blocks, andfill up all space terris.This is a full of fun and very excitingclassic block puzzle game.Block Puzzle is amazing value, packedwith over 1000 FREE mind-bending levels of increasing difficultythat’ll keep you busy for hours. Block Puzzle is incrediblyintuitive and fun for all ages and skill levels. Once you’ve tried,you’ll be hooked!Easy to play and pleasurable game for all age. Therules of Block Puzzle are similar to classic board games.HOW TOPLAY★ Drag block to fill up the frame box, no space.★ Blocks can’tbe rotated.★ No time limit!FEATURES★ Simple rules and Easycontrol.★ Smooth and delicate animation.★ Offer 3~9 bonus hints fora week.★ 1000 FREE puzzles! Download Block Puzzle levels and youwill love this game!You can play terris games for FREE! "Dream of collecting… not jewels, but recipes for the tastiest,most incredible sweets, don’t you? Grab a can of soda; you’ll needit to wash down all the jelly beans and sugar candies! You, yourassistant Ella and the candy-maker Edward will set off on a questto that puzzling place, Candy Valley, where the locals are famousfor their exquisite recipes! Travel with the Rainbow and learn tocook all kinds of delicacies by matching the ingredients! Dangerand hardship await you on your adventure, but you are sure to bestany puzzle without trouble! Cool action waits for kids and adultsalike. Boys and girls, you will have unlimited fun playing thisjewel of a game! You can log in with Facebook, import your progressand play for free anytime you want on your smartphone! A new onlineclassic saga of match 3 games. Simple rules: find the matches,starting from three in a row, and combine them. Become the ultimatecrusher of sweets and digger of recipes. Dash to the most complexpuzzles in the app world, match threes, and rush to the very top!Travel the sweetest land imaginable. Note: The purchases in thein-game store are optional and meant to make game progress easier.A Wi-Fi or mobile Internet connection is needed to play the game —you can’t do it offline." Spring is in the air! 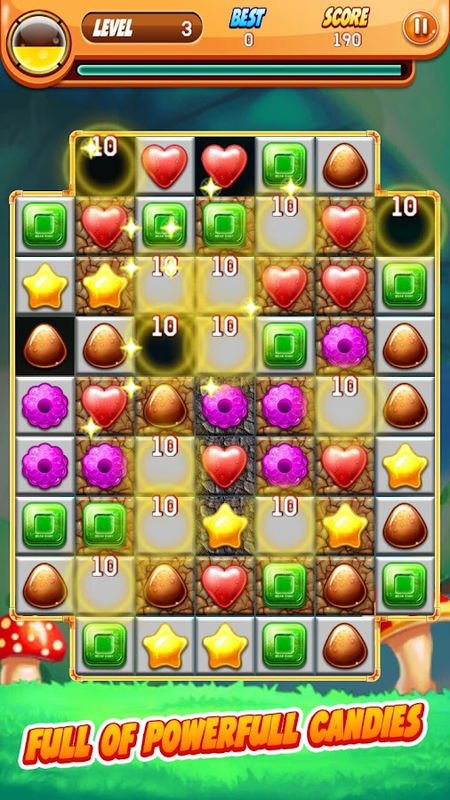 Get in the mood for Easter with thiswonderful match 3 game! Play over 1200 mesmerizing levels filledwith many challenges. Collect the golden eggs, fill your basketwith chocolate goodies and get the Easter bunny out of the magichat. Clear the remaining ice, make the spring flowers bloom andcollect the first butterflies. Eat the cookies, uncover the tastycakes and fire off the explosive candy canes! Easter Sweeper willkeep you engaged until long after Easter! There are no lives tolose, and you don't have to annoy your friends to progress. Play aslong as you want. This game will fill your holidays with lots ofpleasure! Swap, drag and sweep the sweet Easter pieces, like theEaster eggs, the chocolate bunnies, the creamy cupcakes, the candystars and green spring leaves. Make matches of 4 or 5 to createpowerful bombs and power-ups. And use the magic wand to collect asingle piece. You'll be rewarded with cookies, cakes and lots ofchocolates! Be sure to share the fun with your facebook friends.Invite them and compete with them in the leaderboards and on thelevel map! 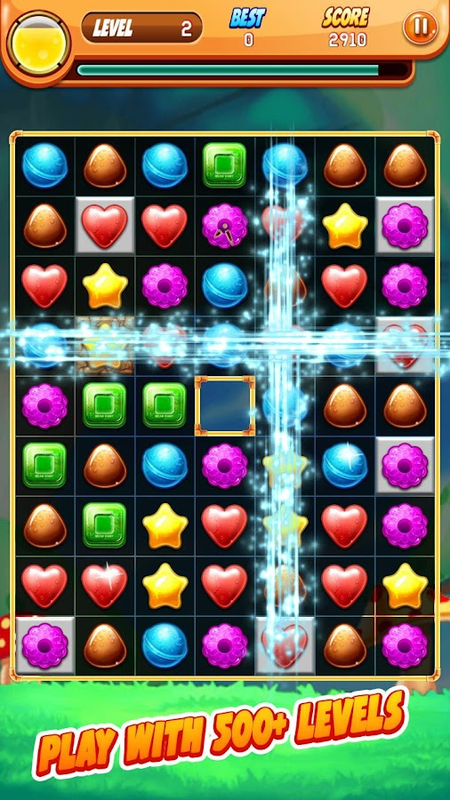 If you like holiday themed match 3 puzzle games, clickand match, swap and match or any type of casual match 3 puzzle gamethen Easter Sweeper is the perfect game for you! Over 100 million people are playing our deliciously sweet match 3games! Cookie Jam is filled with thousands of fun and challengingpuzzles! Match 3 cookies & candy in order to clear the boardand beat the puzzle! Cookie Jam match 3 games are free to play andtons of fun! Play now! Are you tired of matching three candy orspreading jelly? Blast through dessert themed islands and help ChefPanda crush cookies before they crumble in Cookie Jam - theSWEETEST match 3 game on mobile! Play thousands of puzzle games forfree, with new puzzles every week so you never run out of a puzzleto play! Swap candy colored treats and crush delicious cookies andcakes. It’s no wonder people say Cookie Jam is the BEST MATCH 3GAME EVER! We have thousands of match 3 games and puzzle games toenjoy! KEY INGREDIENTS: 🍪 Free to play and fun for everyone! 🍪Never-ending fun with THOUSANDS of unique levels with new onesadded weekly 🍪 Deliciously sweet supply of candy crushing power-upsand combos 🍪 Swap, crush, and jam your way through fantasticalbakery themed islands 🍪 Earn rewards and sweet prizes withlimited-time events 🍪 Connect to Facebook to seamlessly sync acrossmultiple devices and challenge friends! LIKE:https://www.facebook.com/PlayCookieJam FOLLOW: @playcookiejamDEVELOPER INFO: Jam City is the leading developer in trulycross-platform social gaming! Check out our other free match 3games and puzzle games! You'll love to swap, match, and crunchthrough ever expanding levels and events. Check back often to seeall the new candy, cake, and sweet treats that we've added! You'lllove to crush through each sweet puzzle. Begin your bakeryadventure on this free match three game today! Candy Original is one of the most popular and classical match-3puzzle game! Challenge levels and find out those hidden candytreasure! - Over 200 interesting levels - Swap and match 3 or moresame candies - Simple but fluent experience - Delicious and tastycandies designed - Unlimited times to play levels - Differentpowerful boosters - Easy to play in anytime You can download theCandy Original in Google Play completely free! Enjoy the candypleasure! 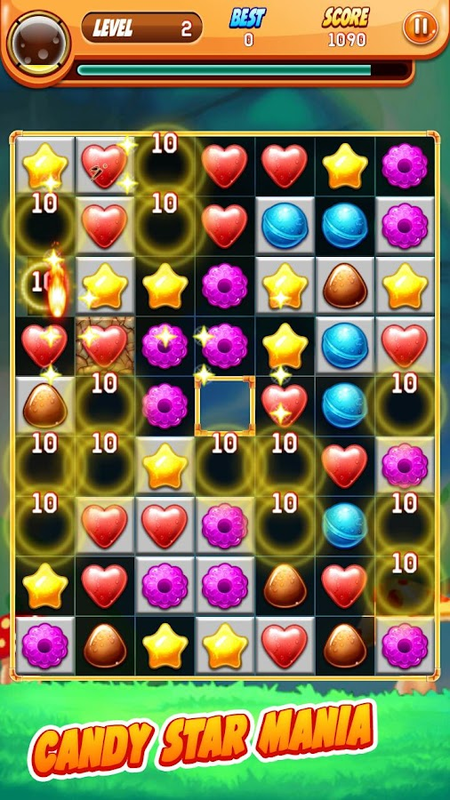 Fall in love with this sweet new Match 3 candy puzzle game! Matchand collect tasty candy treats in Jelly Crush Match 3, theamazingly delicious puzzle adventure guaranteed to satisfy yoursweet tooth! Simple and fun to play but a challenge to master JellyCrush Match 3 Features: PLAY through hundreds of candy ice levelsfilled with creamy dreamy treats! 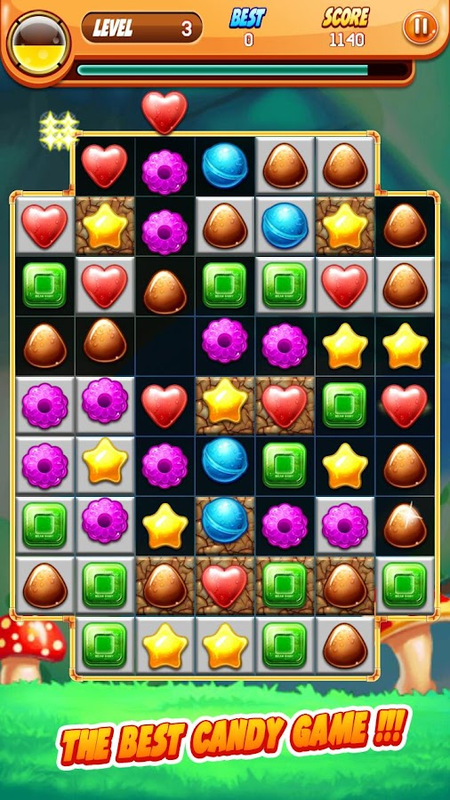 - Match 3 games filled with icecandy, sugar, free fall and sweet treats await! - Adventure throughhundreds of delectable fantasy levels - Addicting frenzy games andmini games take you on the adventure of a lifetime! - Collect sugardrops to advance along the sugar track for special suprises! - 100%Jelly Crush Splash free game to play and enjoy with fall in loveUNCOVER gummy fish bites for free fall the Cat in Ice Fishing Mode!- Matching gummy gems is the best way to fish in this frozenfun-fest - Battle the fish with your matching skills and land ahigh score ★ ★ How to play Jelly Crush Match 3 ★ ★ ✔ Switch andcrush 3 candy or more sweet candy ✔ Crush 4 Jelly in a line tocreate lighting thunder ✔ Crush 5 Jelly with T or L shape to createbomb ✔ Crush 5 Jelly in a line to create color blossom ✔ Combine 2special cakes to make a big surprised yummy blast! ✔ Collect candycontain gift time, double score Jelly Crush Match 3 is FREE to playwith FREE updates including new levels, obstacles, treats, and moreevery week! Match 3 games have never been so sweet! Jelly CrushMatch 3 and sweet treats abound in this frozen sugar rush! Last butnot least, a big THANK YOU goes out to everyone who has playedJelly Crush Match 3 for free! MATCH. JUICE. SERVE. REPEAT! Juice Jam- a juicy new match 3 puzzlegame with bushels of fruity challenges! Join Kiwi, Mango, and therest of the Juice Jam gang as you travel through hundreds of newworlds. Embark on this fruity adventure today! Features: ◆ Hundredsof juicy levels! ◆ Brand new power-ups and ways to play! ◆ Jamfruit to concoct sweet treats! ◆ Swap and blast your way throughever expanding new worlds! ◆ Check back often for events, freerewards and new levels! ◆ Free and filled with adventure! Join usin Juicetopia as Kiwi and Mango tour whimsical lands serving juiceto thirsty customers! With a cast of quirky characters, a richlydetailed world and addictive match-3 gameplay, Juice Jam is sure tosatisfy! LIKE: https://www.facebook.com/JuiceJamGame FOLLOW:https://twitter.com/juicejamgame LEARN: www.juicejam.com DEVELOPERINFO: Jam City is the leading developer in truly cross-platformsocial gaming! Check out our other free match 3 puzzle games!You'll love to swap, match, and crunch through ever expandinglevels and events. Check back often to see all the new candy, cake,and sweet treats that we've added! You'll love to crush througheach sweet puzzle. Begin your adventure on this free match threepuzzle game today! Welcome to the world of Candy Light, Candy Light is a veryaddictive match-three game! Candy Light is a brand new and amazingcasual game! How to play: - Tap the same candy blocks quickly! -Special combinations (4 in line, 5 in line, L shaped combinations)create super candies Candy Light Tips: - Use special items to clearcandies - Tap candies very fast, and try to make more combos! -Over 200 interesting levels Free to play Candy Light game! It'sexciting, sweet and delicious!